Summertime is the perfect season to have some fun outdoors, and Keds are the perfect shoes to wear on all of your adventures. Here are four outfit ideas that are awesome for the summer! The nautical look is everywhere this summer, and Keds’ Starbird Neon shoes are right on trend! Match the cool blue Keds with a sailor inspired top and a pair of loose fitting shorts for a fun day in the sun. We like the white cotton polo with navy stripes from Marc by Marc Jacobs, paired with grey denim cuffed shorts made by Alice + Olivia. 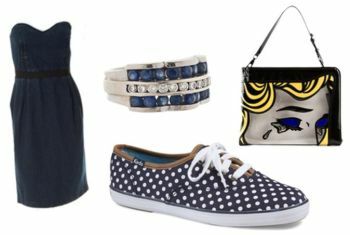 Throw in a matching blue and white tote bag designed by Diane von Furstenberg, and you’ve got the perfect outfit to wear on the boardwalk! Shades of peach have been on the fashion radar since last year, but that doesn’t mean peach isn’t making a comeback for the summer of 2013! The peachy Keds Champion Sparkle Lace are adorable, and would look great mixed with other shades of peach and pink. The pretty Diane von Furstenberg silk blouse is flirty and cool for summer. You can wear the blouse with some floral printed jeans by Haute Hippie and Rebecca Minkoff’s peach striped boyfriend bag for an amazing summer date night outfit! Sometimes being stuck at home during the summer is boring, so you have to think of new things to do! Going to your local museum or an art show is a fun way to spend an otherwise boring afternoon. Get dressed up and take some photos while you’re there! Keds Champion Dot shoes will keep your feet both comfortable and stylish while you browse. A strapless dress like the one from Acne for Lanvin will keep you cool, and a couple of statement pieces will complete your outfit. 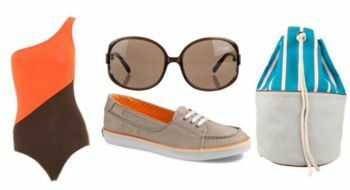 Try a ring that matches your shoe color, or a witty 3.1 Phillip Lim pop-art handbag! Going to the beach or pool is almost inevitable for most of us during the summer. When the weather gets too hot you can throw on a pair of Beacon Keds and a swim suit; then head for the water! Laura Urbinati makes chic bathing suits for every body type, and you can store your swimwear in a trendy beach bag by Cuval. If you’re going to an outdoor pool, lake or beach, be sure to wear sunscreen and protect your eyes with some sunglasses like the ones from the Just Cavalli line.